Is Nuffield the richest educational institution in the world per capita? A commonly held claim is that Nuffield is the richest educational institution in the world per capita. This claim even featured in the 2012 pantomime. But is it true? 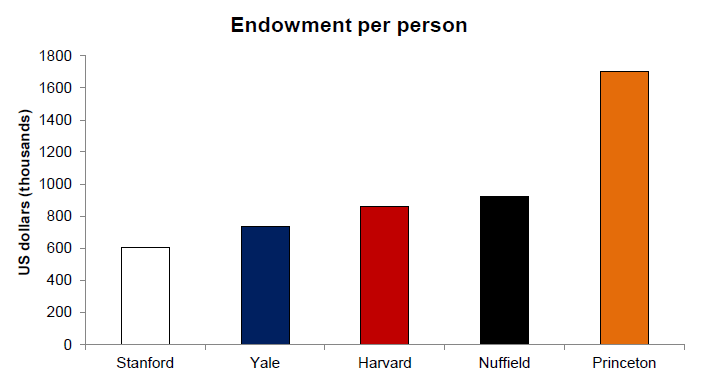 In this post, I compare Nuffield's endowment per capita to the endoment per capita of Harvard, Yale, Princeton and Stanford--the four richest U.S. colleges. Since it is not exactly clear how 'endowment per capita' should be defined, I use three alternative definitions. The first is: endowment per student = endowment / students. The second is: endowment per academic person = endowment / (students + faculty + post-docs). And the third is: endowment per person = endowment / (students + faculty + post-docs + admin staff). 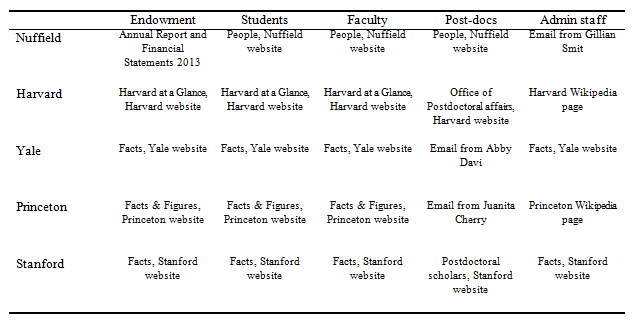 The table below displays the endowments, students, faculty, post-docs and admin staff at the five institutions under comparison. The sources for all these figures are given in the next table. I have tried to rely on official sources as far as possible. All figures are from 2013, except possibly those for Harvard's and Princeton's admin staff. I obtained the Nuffield endowment by converting the college's net assets for 2013 (£175,415,000) into dollars. I obtained the Nuffield faculty by adding together the governing body, the senior research fellows, and the honorary and visiting fellows. While it might seem incorrect to include the college's honorary and visiting fellows (47), my understanding is that one or both of these categories are included in the American institutions' figures. For example, Princeton's website states: "Faculty, including full time, part time and visiting." Nevertheless, I will describe how the rankings change when the college's honorary and visiting fellows are excluded. The first graph shows the endowment per student of each institution. Nuffield's is indeed the largest. 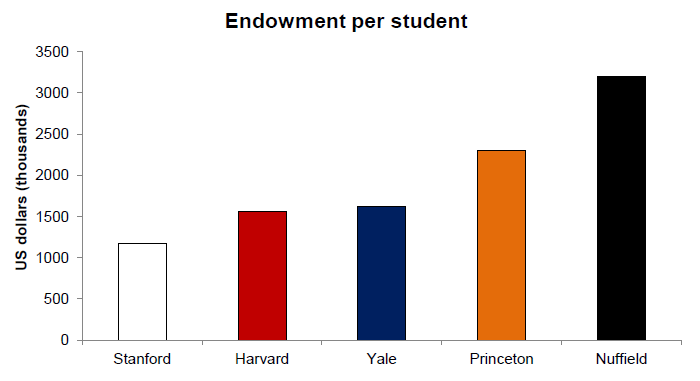 The second graph shows the endowment per academic person of each institution. Here, Nuffield finishes in third place behind Harvard and Princeton. The third graph shows the endowment per person of each institution. Here, Nuffield finishes in second place behind Princeton. 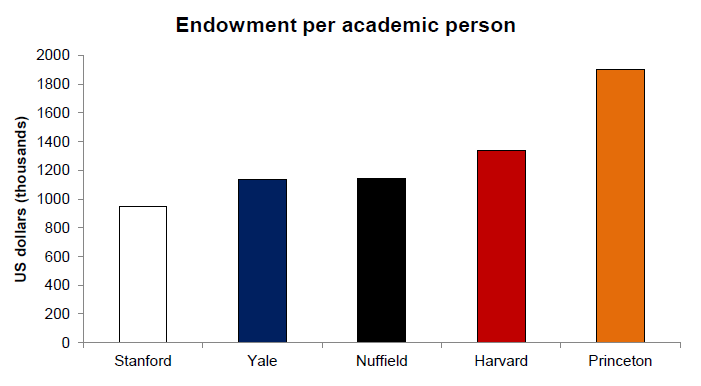 If Nuffield's honorary and visiting fellows are excluded, the college moves into second place on endowment per academic person, and remains in second place on endowment per person. Therefore, while Nuffield may be the richest educational institution in the world per student, it does not seem to be the richest educational institution in the world per academic person or per person. One caveat is that the figure for Princeton's admin staff comes from the University's Wikipedia page, which does not provide a source. However, the figures for Princeton's students, faculty and post-docs are all from official sources, so--at the very least--Nuffield is unlikely to be the richest educational institution in the world per academic person. Should non-donors be entitled to other people's organs? There are two main systems for deciding what happens to someone's organs when he dies. The first is the opt-in system: unless an individual registers to be an organ donor, he is presumed not to be one. The second is the opt-out system: unless an individual registers not to be an organ donor, he is presumed to be one. The opt-in system is also known as "explicit consent", while the opt-out system is also known as "presumed consent". It is well known that the effective donation rate is considerably higher in countries with the opt-out system. In other words, many more organs are available for transplantation in countries where people must actively opt out of being an organ donor. Luckily, this problem could be solved with a relatively minor tweak. Just like in the conventional opt-out system, every individual would be be an organ donor unless he had registered not to be one. But in addition, no individual's organs would go to a non-donor unless he had registered to allow them to do so. Therefore, the default situation for a newborn baby would be as follows: it is presumed that he is an organ donor, and it is presumed that his organs will not go to a non-donor. Under this alternative system, there would be a cost to opting out of being an organ donor, namely that most people might not be willing to let their organs go to non-donors. If a person felt strongly that anybody should be entitled to her organs––even people who had not been willing to donate theirs––she could register to allow her organs to go to non-donors. But if a person felt that only people who had been willing to donate their organs should be entitled to hers, she would not have to do anything. My guess is that the effective donation rate would be even higher under this alternative system than it is under the conventional opt-out system. 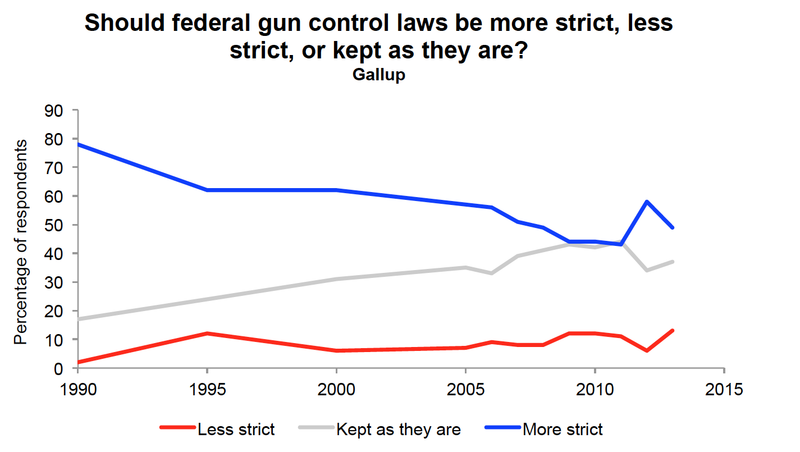 Do Americans want stricter gun control? In short, no. 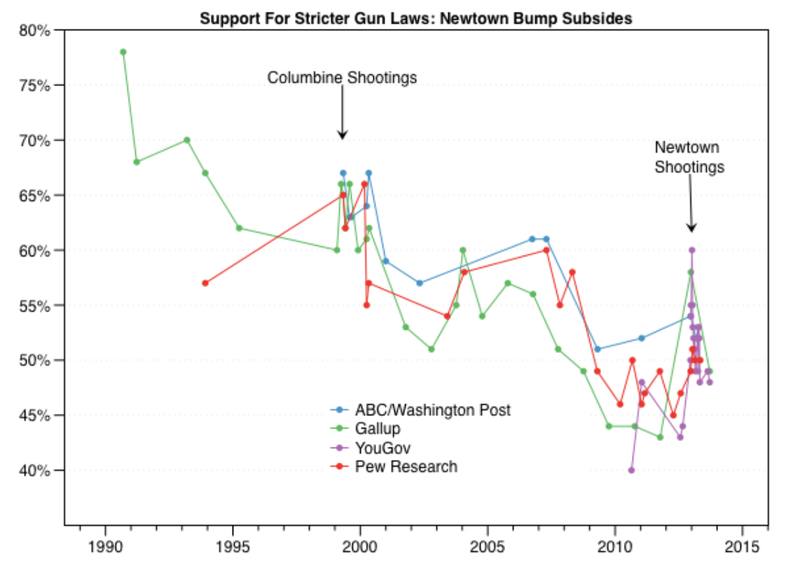 Support for stricter gun control has undergone a bumpy decline for the past few decades. 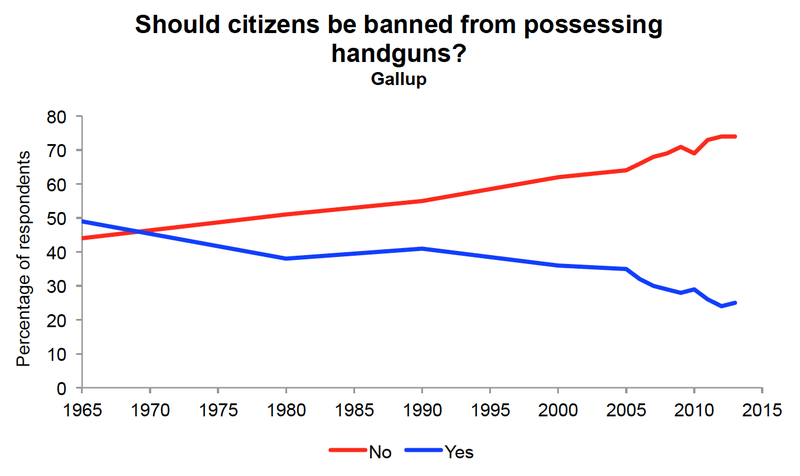 This trend is depicted in the following four charts. "This guy is from Argentina." What do economists think about drug policy? Since the late 1960s, Gallup has been asking Americans whether they think marijuana should be legalized. The proportion favouring legalization has been creeping up since the early 1990s, and 2013 was the first year in which a majority of Americans (58%) favoured legalization. 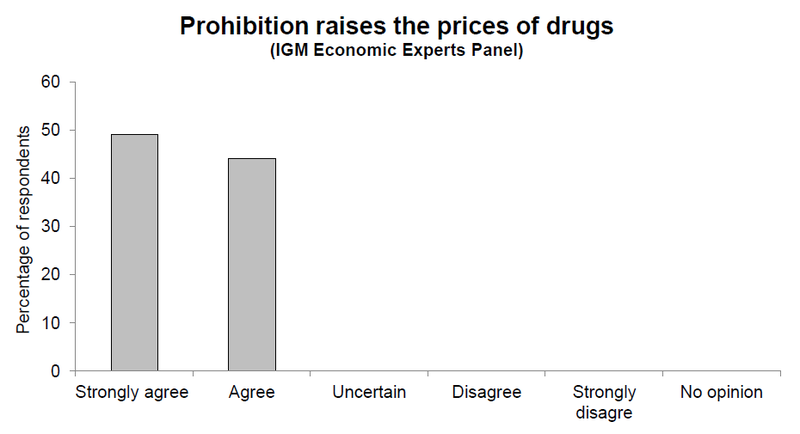 In this post, I examine professional economists' opinions on drug policy. I was able to find two relevant surveys. Unfortunately, neither is particularly comprehensive. The first is a survey of a random sample of 117 members of the American Economic Association, which was carried out by Mark Thornton. The second is a survey administered to the IGM Economic Experts Panel. 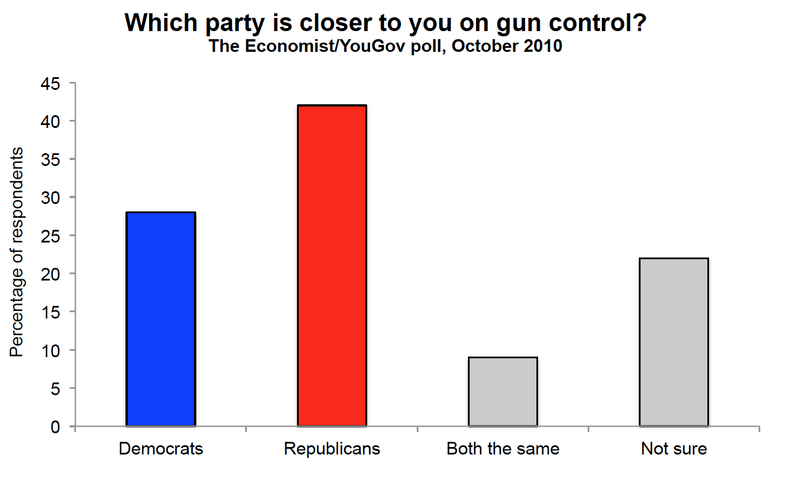 The main finding from the first survey is shown in the chart below. 52% of the economists surveyed supported decriminilization, while 38% opposed it. 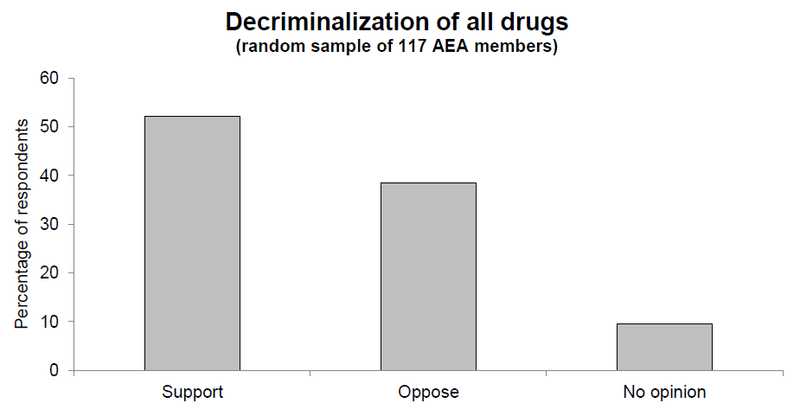 Among those who supported decriminilization, only 30% were in favour of full-scale legalization. Thornton also carried out a qualitative survey of economists who had published in the area of drug prohibition. There he documented "an even greater consensus which is critical of prohibition and supportive of policy reforms in the direction of decriminalization, and to a lesser extent, legalization." The findings from the second survey are shown in the charts below. The economists were first asked to state their agreement with, "All else equal, making drugs illegal raises street prices for those drugs because suppliers require extra compensation for the risk of incarceration and other punishments." An overwhelming majority agreed. This is important because many addicts turn to crime primarily in order to fund their exorbitant drug habit. The economists were then asked to state their agreement with, "The Netherlands restrictions on “soft drugs” combined with a moderate tax aimed at deterring their consumption would have lower social costs than continuing to prohibit use of those drugs as in the US." Again, a large majority agreed. 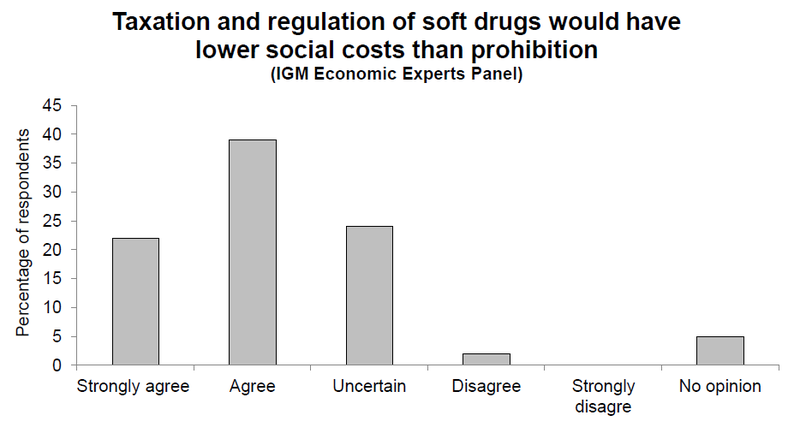 Overall, economists seem to strongly support legalization of soft drugs, and are inclined toward the decriminilization of all drugs. Furthermore, those who have studied the issue in the greatest detail are the strongest advocates of decriminilization and legalization. A couple of weeks ago, I posted about a paper by Burkhauser et al., which argues that, contrary to popular belief, median income in the U.S. has not stagnated since the late 1970s. Interestingly, Greg Mankiw wrote about the paper just a few days later on his own blog. The CBO's finding is shown in the chart below. 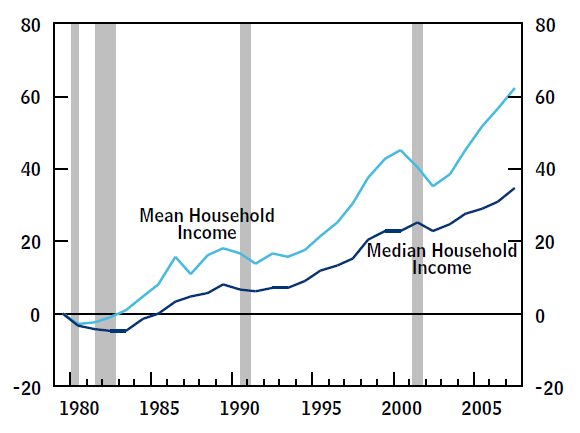 Between 1979 and 2007, median household income in the U.S. rose by about 35%. (Note that Burkhauser et al. estimated an increase of 36.7%.) Mean household income rose by considerably more, which reflects the fact that richer Americans experienced higher income growth than poorer Americans. Indeed, consistent with previous work, the CBO also found that the distribution of household income became substantially more unequal over the time period in question. Details of the CBO's definition of 'household income' can be found in the Notes and Definitions section at the beginning of the report. It would appear that they considered total post-tax, post-transfer income, adjusted for inflation and household size.